List of X: The woman on the right suddenly realized that her cup is filled with ice. Omawarisan: I can’t think of anything. It’s just that I can’t get past how that works out at a urinal. 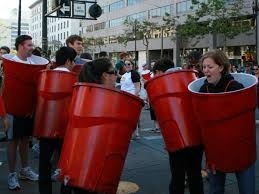 Calahan: Moments later, the red cups ran into a group of tobacco-spitting rednecks. Things got ugly. And drippy. I saw once on Facebook, of course, that in Europe, if a person is having an American themed party, red solo cup are a must!! It’s good to know we Americans project such a high level of class overseas. Okay… sorry… one more thing. your answers were the best… not sure if #4 or the last one is my favorite. That doesn’t include time spent getting undressed, so it’s not as bad as it sounds. One minute is 45 secs longer than me! Oh, how I envy you! And keep in mind that doesn’t the time it takes to get my PJs off, so yeah — read it and weep. I know my wife does.